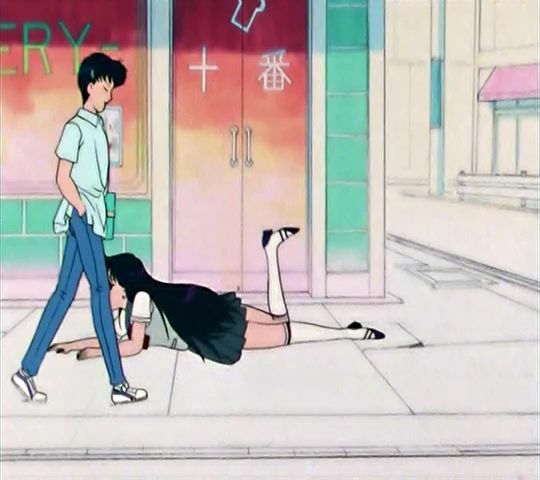 While there are quite a few differences between Rei in the anime and the manga, one of the more striking differences between the two is the storyline where Rei and Mamoru briefly dated in the first season of the Sailor Moon anime. Though Mamoru himself was no stranger to differences between the two mediums, how it is that the cool, mysterious, and boy-hating1 (!) Rei from the manga went so far into the opposite direction and ended up pursuing Mamoru so aggressively is more than a bit out of character for her. So how did this wind up happening and what does this tell us about Rei’s character in the anime? More than likely, this is in reference to what is known in Japanese as 三高 (sankou; the three highs): high salary, high-class education, and physical height.3 During the bubble economy4 – from the late 80’s to early 90’s – these attributes were said to be what was most valued by Japanese women when choosing a potential boyfriend or future husband. From Rei’s point of view, as the daughter of a politician and a student at an elite private school, it was only natural that Mamoru would make a good match for her. It’s possible, I suppose, that she could also sense Mamoru and Usagi’s budding feelings for each other and this was meant to be antagonistic, but that’s just speculation and I really don’t see Rei as that type of person. Perhaps the greatest source of information on (anime) Rei’s outlook on love and romance comes from an interview5 with Michie Tomizawa, Iriya Azuma, and Sukehiro Tomita (Rei’s voice actress and Sailor Moon‘s producer and scenario writer, respectively). In it, the producer (Azuma) admits that Rei and Michie have the strongest resemblance between all of the voice actresses of their respective characters, and even that the animation staff often sit in on the post-recordings and take notes for how to evolve the characters. This may help explain her completely different approaches toward her relationships with Mamoru and Yuichiro, wherein she directly pursues Mamoru but seems to interact with him more like a friend, particularly in the Sailor Moon R anime where she can occasionally be seen spending time together with Mamoru and ChibiUsa, while completely ignoring or even yelling at Yuichiro. Further discussion on her relationship with him, however, will have to wait for another time! 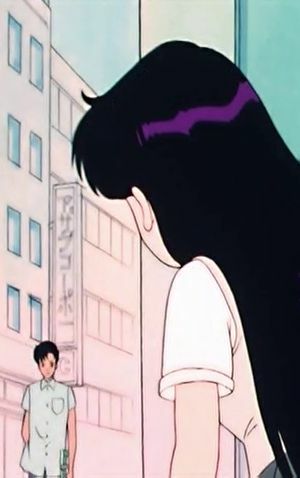 Whether you love or hate the way Rei differed in the anime and manga, she did serve as an interesting foil in the series to play against Usagi and even helped bring out some of Usagi’s feelings toward Mamoru prior to the big Tuxedo Mask reveal (something which fans often describe as happening too fast in the manga). It’s interesting to see that a lot of this actually came about from Ms. Tomizawa’s take on the character and how the production staff chose to adapt Rei’s personality to match the person providing her voice (both literally and figuratively)! Read also: What Health Problems Did Usagi's Voice Actress Suffer From During Recording? ← What is the Inspiration Behind Sailor Saturn’s Silence Glaive? I was re-reading manga a few days ago (I’ve read it once 4 or 5 years ago and didn’t like it so never read it again), because of how people are taklking about it and Crystal that is now even more 1-to-1 adaptation since season 3… and… wel… still don’t like it. I don’t think its bad, it’s just not the same Sailor Moon I like. 😛 Personal stuff. But what I was going to write – during this re-read I saw many little things that was inspiration for anime makers to do a very different take on those things. They treated manga more like inspiration and book of ideas, often interprete in different way to fit their own story. For example inners and outers conflict in the manga was more sub-plot and was ended quite fast, but in S they made it one of main themes of season and cynism-vs-idealism aspect was a lot more stronger. Thanks for the comment! Actually, I am in total agreement with you on this issue, and I think it’s something that often a lot of fans forget — the anime and the manga are best considered as two different re-tellings of the same story rather than to be seen as a “right” or “wrong” adaptation. By the very nature of the fact that the manga was so much shorter, it really didn’t have the opportunity to dive as deep into or explore the personal lives of as many characters, which is something I think the anime actually did a much better job of. Glad to hear that I’m not the only unapologetic fan of anime Rei! Yes, every adaptation is a retelling, but anime was often really far from manga. It’s hard to me to find so many differences between any book and movie based on this book as there is between SM anime and manga (maybe Percy Jackson). Hmm.. how about the US-made live-action Dragonball movie and the original Japanese manga? I mean, sure, that’s kinda cheating when it comes to a story being changed since that movie was so horrible, but it should at least get some sort of award for being so bad! Limiting it to only anime/manga, though… I’m not sure I can think of many other examples where the stories strayed so far from each other. I think a lot of this can be credited to the Sailor Moon anime and manga being directed at slightly different audiences, with the manga skewing a bit older to junior high girls while the anime was for much younger children, and aired during the “Golden Time” on Saturday evenings, were families typically watched tv together. I’ve always loved Mamoru’s character, especially with some of the bizarre quirks the anime staff decided to put into his personality, like his love for anime magazines in one of the audio dramas, or where he was riding the panda train in season one at the theme park. He may be older and mysterious, but they hint that he didn’t quite 100% grow up, possibly from his accident with his parents. He had a little more depth than in the manga, I think. As another unapologetic fan of anime Rei, this is my perspective on the whole dating thing. By which I mean anything I say here is purely opinion. Initially Rei needed a boy to take to the park before it was demolished, the way it was presented came across as a sort of personal challenge to herself. And Mamoru was the best she could find on short notice, essentially making him a means to the end. Another factor may have been her suspecting him of being Tuxedo Mask, which was suggested back in episode 11. However after she got to know him more she probably thought it might blossom into something, and so started dressing herself up a bit more when with him. Mamoru probably humoured her out of courtesy. After a while however it starts to become clear to Rei that the two of them just aren’t that compatible, this culminates round about episode 31. Skip ahead to 38 where she can see that Usagi clearly has genuine feelings for Mamoru. And instead of acting petty and jealous, rather maturely supports and encourages their relationship. I see the writers partially using this as a device to develop their friendship more. This is probably why they introduced Yuuichirou to provide an alternative and to soften the blow, though I don’t think it was really necessary. Again this is another personal interpretation, but I don’t really see Rei being in a serious long term relationship with anyone (homo or hetero). Like Minako she’s too much of a free spirit, rather then the settling down type. She might play the field occasionally, but ultimately is more invested in pursuing a career then a love life. Basically it doesn’t go much beyond ‘just good friends’. On the influence note, Michie is a big fan of Michael Jackson. This also carried across to the character and was referenced briefly in an episode of S, as well as in various other forms. I for one, am perfectly fine with the anime being different from the manga. It’s pacing and structure didn’t really lend itself that well to a TV format anyway. If I’m honest I don’t think it lent itself that well to a manga either. PS: I loathe the term ‘True Fan’. It’s just something elitist nobs came up with to put more importance on themselves. YAY! I feel like we need to make a fanclub for unapologetic anime Rei fans. As you mention, the characters are so open to interpretation (and, indeed, there are so many different official interpretations of Rei between the anime, manga, musicals, live action, and even the Crystal anime) that it seems disingenuous to suggest that there’s something of a “true” fan because you think that one version is more accurate than another. As sacrilegious as it is for me to admit this, one of the things that I like the least about the Crystal anime is precisely that it does follow the manga so closely. What’s so nice about the fact that the manga, anime, and live action series all differed so much is that I felt like I was getting to see more and more of the same universe, rather than seeing it in a different medium. But alas, I know that a lot of people really praise how closely Crystal follows the manga. Onto the topic of the dating itself, I’d have to mostly agree with your interpretation, especially on the topic of Yuuichirou not being necessary, and how unlikely it seems that Rei would actually stick to a long-term relationship. I don’t meant to suggest that she’s selfish — she definitely isn’t when it comes to her friends — but I feel like she simply isn’t the type to want to put a love interest first and foremost over all her other hobbies and talents. Gotta admit, though, that I really don’t like Yuuichirou as it is since he was way too comedic and just seemed like a slacker… but I suppose that’s just a matter of opinion! I’m sure he has some fans… right? You should search out someone called Jet Wolf, she’s like the Pope of unapologetic anime Rei fans. I see Rei’s relationship with Yuuichirou more akin to that of taking pity on a stray dog. She can see he’s a decent enough guy, despite being a bit of goof. Besides, if she can put up with her grandfather and Usagi’s antics, she can definitely put up with his. Ironically, whilst a handful of purists might be pleased with a ‘true adaptation’, the reality is that Crystal is almost universally panned. Although there have been massive improvements with the Infinity Arc, it’s adherence to the manga is still restricting it. So all I keep on seeing is missed opportunities. Plus since I know how the plot goes anyway, there’s very little to surprise me. I think that’s one of the reasons why I’m so far preferring the newer musicals. Despite being shorter, they’re significantly more creative with the material. If this were 15-20 years ago, we’d totally have a webring, guestbook, and a whole web shrine ready to go for anime Rei. I miss you, web 1.0. While I do like the fact that the anime did try to give characters other than Usagi a love interest once in awhile (even if, other than Yuuichirou, they were basically just characters of the day), there’s just something about Yuuichirou that just doesn’t fit in well into the series. I did like what they did with him and Rei in Sailor Moon S, though, and that made me like him a little bit better, but other than that I’d agree it’s more like a pity thing, or like looking after your younger brother (despite him being older). As it stands, I always imagined Rei being far more likely to take after in her father’s footsteps (either as a high-powered business woman or a politician) than after her grandfather to continue the family shrine. I have to admit that I actually have only seen a handful of the musicals, but I really loved their quirky humor mixed in with surprisingly deep story lines. Do they have any sort of internal consistency between the musicals (a universe/lore/canon unique to the musicals), or is it generally a sort of one-shot affair? I really need to get around to watching them! The way I see it, Yuuichirou will probably take over the shrine whilst Rei moves onto bigger things. As for the musicals, the recent three could arguably follow a loose continuity as they are in Arc order (though the performers change). They draw largely from the anime, but inject stuff from the manga as well. Since they’re only a few hours long, they pretty much chuck you into the middle of the storyline. The rest are pretty much self contained. The best in my opinion are the ones that focus on original storylines, such as “Legend of Kaguya Island“. Thanks! Will definitely have to check them out. Haven’t seen any of the musicals in ~10 years, but I bought the novelization for one recently. Need to get back to reading it! I like Yuuichirou! 🙂 I have mixed feelings about him and Rei as a couple (it would be nice if they end up together, but it’s not a tragedy that they didin’t), but he was really funny and nice guy with a bit of some more serious background suggested. The interview with Michie that I referenced in this article had more of her (and the director’s) thoughts on Rei’s relationship with Yuuichirou, which were actually pretty interesting. It wasn’t relevant to the article so I left it out, but I’d love to post the whole translated interview at some point! Basically, she said that Yuuichirou is always just “one push” shy of winning over Rei’s heart, because he’s too timid. But if he’d just make that extra push, Rei might fall for him. She also talks jokingly about how she’s dismissive of him, but if other women were to approach him she’d get really upset over it and that might spark something. I love Anime Rei the most, she embodies her element more in my opinion in the Anime vs the Manga/Crystal I also love that due to her personality being how it is in the Anime her relationship with Usagi is that much deeper. Oh how I would love a Rei Hino web shrine again hehehe Nostalgia but yes I do prefer her version of the Anime over the Manga. I love the Rei anime more,I love how funny when she an Usagi fights over simple things, its like she always tells Usagi the truth even if it will hurt Usagi,she is honest and true to herself,but behind that facade she is the one who were very protective of Usagi.